adapt IT was started by Derek Standley, a computer systems expert who has over 25 years experience in computing, technology and software development. Derek was successful in leading the team that secured the contract for the London Congestion Charge system, including the world’s largest CCTV number plate recognition system. He has since gone on to deliver IT solutions for over 65 companies with an unparalleled level of service. adaptIT provides premium business support, including advice, installation, configuration and maintenance services, to a range of companies within a 50 mile radius of its offices near Hertford. Our customers are usually acquired by word of mouth and we boast a 100% retention rate, currently serving over 60 long-term clients. Pictured below are some of the team that keep the adaptIT cogs turning. It is fair to say that if you decide to give us a call you will be greeted by one of the team members below. 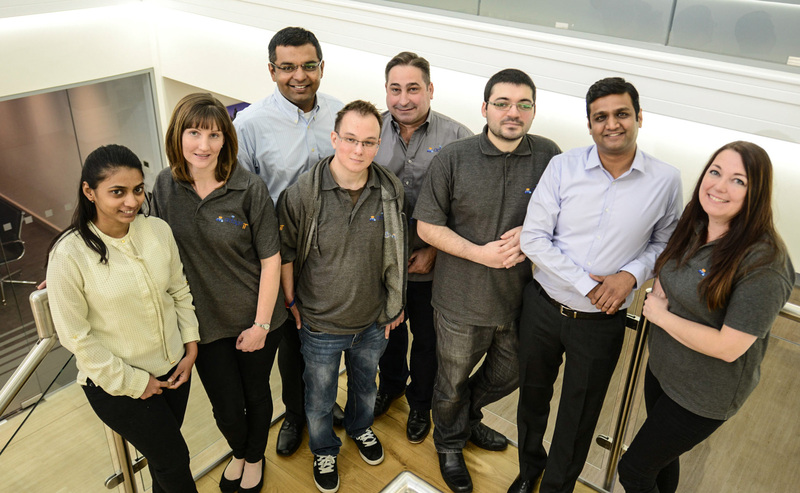 So let me introduce you, going from left to right we have Chandni – Software development, Rebecca – Accounts (Director), Ritesh – Software development, Andy – IT support, Derek – IT support (CEO), Tony – IT support, Nirav – IT security and Sharon – Accounts. Everyone at adaptIT puts 100% into everything we do, so as the owner of adaptIT, I would like to thank the entire team, including those that couldn’t leave their post to attend the web photo shoot. adaptIT seamlessly integrate with your team, bringing high level IT service and support to your business in a personable, efficient and affordable way. Your business and your data is of the utmost importance to us, and with no task viewed as insignificant, our aim is to always go the extra mile to ensure continued customer satisfaction every step of the way. By letting adaptIT take full responsibility for your IT services and support you remove the headache of network disruptions and costly IT bills, and you can relax confident in the knowledge that your IT services are in more than safe hands. Our experienced team of qualified IT Security Specialists and electrical personnel, combined with our NICEIC Electrical Contractor Accreditation, ensures that we always deliver a professional and reliable service. If you would like to learn more about adaptIT and how we can help your business, why not pick up the phone and give us a call. We are technical (not sales) people, so we promise not to hassle you afterwards. We look forward to supporting your business.